March 2017's LookFantastic Beauty Box is the Elle Edit - for a while now, the beauty box has been accompanied by a copy of the Elle UK magazine each month, something that I've come to love. 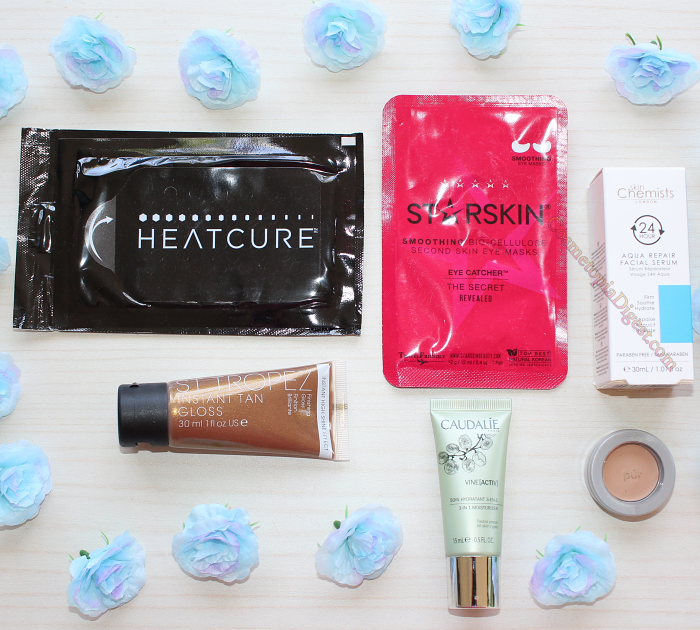 This month's box has been specially curated to bring us "the most exciting beauty products" around. 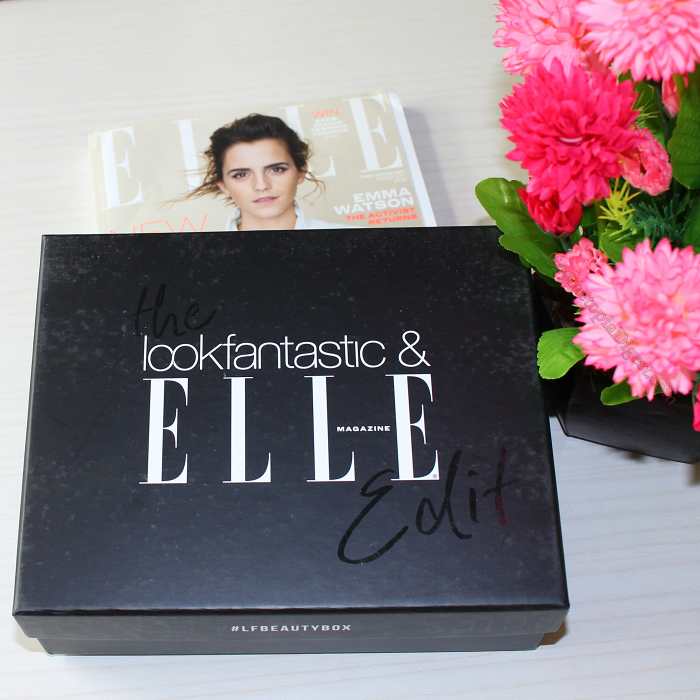 Of course, the box comes with the Elle UK magazine, featuring Emma Watson. There's also the Beauty Box magazine - now a glossy number with a few articles, and not just a product card. Scroll down for the contents of the LookFantastic Beauty Box March 2017. I hate receiving concealers - or foundations - in beauty boxes. I'm South Asian, and we probably have what is possibly the widest range of skintones among any race. I'm olive with very yellow tones. I received the shade "Light", which is a pink-toned shade, so I'm not even going to bother swatching it. It goes into my giveaway box. Now this is promising. A 30ml tube of a paraben-free, firming, soothing, and hydrating serum is just what my subcised, dermarolled and generally tortured skin needs right now. SkinChemists is a UK-based brand, and this serum primarily contains rose water and aloe vera. I love Caudalie, and I'm glad to receive a product I haven't tried before. For a moisturiser, this one is incredibly runny, and reminds me of Caudalie's C15 Serum (smells like it as well). I'm going to try layering it over the C15 serum. Or maybe I can layer it beneath even more moisture! The skincare junkie in me has a million plans. I'm going trekking next week and will come back nicely tanned, thank you very much. Besides, I already have enough fake tan to cover a small country, thanks to beauty boxes. A very interesting product for the hair. You peel this panel, and then the product inside heats up, while you shampoo. You then apply the warm product as a condish, leave it in for a while, and rinse off. Heat-conditioning is exactly what my terribly dehydrated, frizzy hair needs. Will try it after coming back from the trek. This is Starskin's Smoothing Coconut Bio-Cellulose Second Skin Eye Mask. What a mouthful. This contains coconut, chamomile, and liquorice root extract, to reduce dark circles, fine lines and puffiness. Will try after coming back from trek, since I barely have the time to pack. I'm very pleased with the serum, the hair treatment, the Caudalie, and the eye mask. Two misses in this box - the concealer, and the fake tan. These would have been appreciated if my skintone suited either product. This is why I keep on saying that beauty boxes must avoid sending concealers and foundations. Are these "the most exciting products in the industry", as promised? The hair heat mask, yes, maybe, but I daresay there are far more exciting products out there, even on LookFantastic. Alpha-H Liquid Gold; a swishy new highlighter; an Eylure brow product; a pretty eyeshadow; a matte lipstick from Bourjois - these would have been a lot more exciting for an Elle-Edit beauty box. Just my opinion. Anyway, I'm looking forward to seeing the contents of the April 2017 box. To subscribe to LookFantastic, go here - each box costs £15, and long-term subscriptions save you up to £2 per box, and you don't have to prepay. They ship worldwide, of course.